I’ve been updating Twitter and Facebook for the Historical Novel Society since the beginning of August in preparation for the conference in London which took place this past weekend. There were quite a few speakers and talks to mention, so I set up a spreadsheet, the only way to keep track of everyone. I read interviews and blog posts, watched YouTube clips and the best book trailer I've seen, for Giles Kristian’s God of Vengeance, made by Philip Stevens. Now that’s how to make a book trailer. 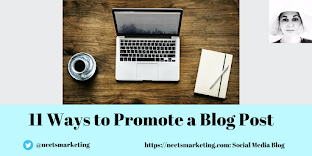 (Find out more about their talk on book trailers in Christina Courtenay's post on the conference). I knew some speakers already, through the RNA eg. Alison Morton and Jean Fullerton; and of many through Twitter. 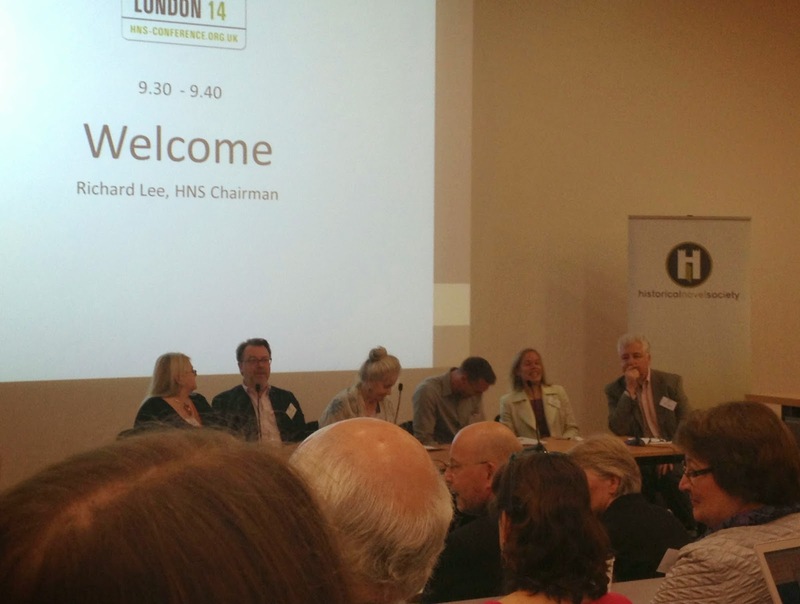 This helped when I put together the 'Who’s Who at #HNSLondon14?' posts for the HNS Facebook Page.Videos of the main talks will be on YouTube soon (follow @histnovsoc on Twitter to find out when). 'Selling Historical Fiction: the challenges and triumphs', chaired by Carole Blake (Blake Friedmann Literary Agency); and with Matt Bates (WH Smith Travel Fiction Buyer), Nick Sayers (Hodder and Stoughton), Simon Taylor (Transworld), Katie Bond (National Trust); and Susan Watt (Heron Books). This was an informative discussion with up-to-date information on the market. Matt Bates said he'd done his own survey to see which periods sell the most, with unsurprisingly Tudor being top by a long way (excluding Gregory and Mantel). 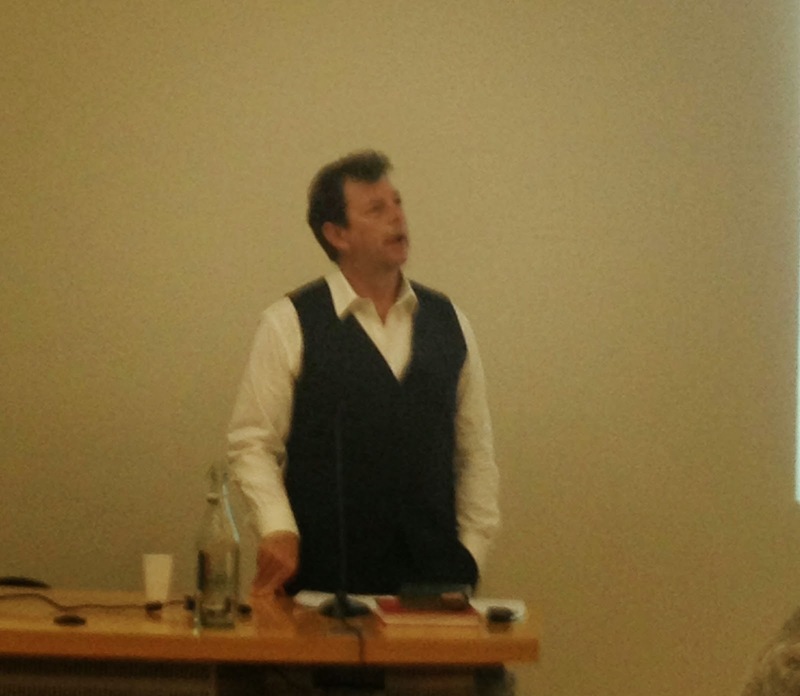 Simon Taylor talked about films and television series influencing demand for books, eg. Game of Thrones. Matt Bates said 'Get the cover right' and Carole Blake made the point that a cover needs to look good as a thumbnail online for an ebook, as well as for the physical book. The panel discussed piracy and Carole Blake said she has Google Alerts set for her clients and she tells the publisher in each case. If you ever get the chance to hear Conn speak, take it! He told a series of anecdotes, peppered with wit, to move and reflect on; including one about his father during The Second World War, and an astonishing coincidence fifty years later; and one about Eddie O’Hare, informant at Al Capone’s trial, with another about Eddie’s son. Conn talked about Richard III, Julias Caesar and read out some beautiful words written by Henry VIII. He told us how he got into writing (always love to hear these stories), that he wrote one book a year from the age of thirteen for thirteen years, continued despite rejection after rejection and eventually got published. 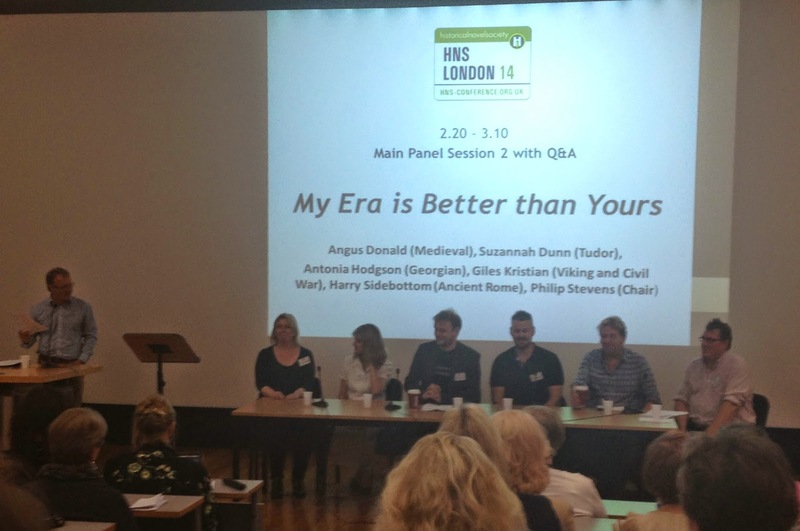 ‘My Era is better than Yours’ panel, chaired by film director, Philip Stevens (see above book trailer); and with Angus Donald (Medieval), Susannah Dunn (Tudor), Antonia Hodgson (Georgian), Giles Kristian (Viking and Civil War), Harry Sidebottom (Ancient Rome). The novel I'm working on is set during the eighteenth century so I cheered on the Georgian era, but all panellists fought a good battle. Giles Kristian attempted to dominate in typical Viking style, with much mentioning of axes, but Antonia did a great job representing the Georgian period (apart from the mention of vomiting in the street); and I’ve downloaded her novel, ‘The Devil in the Marshalsea’, which I can’t wait to read. 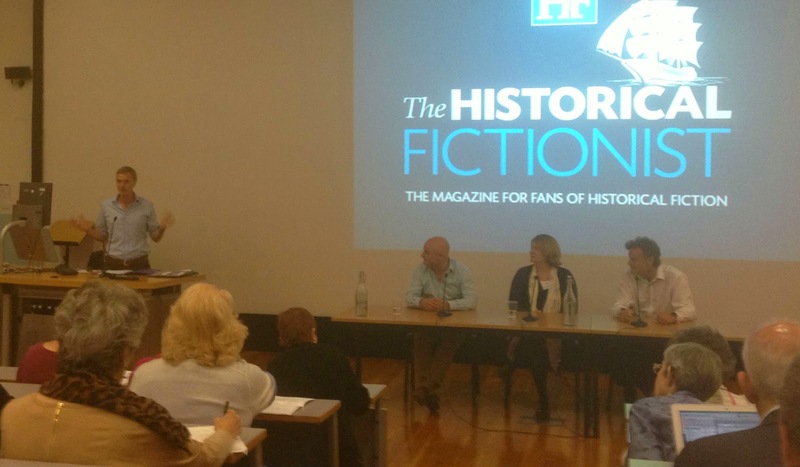 Confronting Historical Fact with the Unexplained’ panel, chaired by Kate Forsyth; and with Jessie Burton, Essie Fox, Deborah Harkness, Diana Wallace. You only have to look at the tweets from Sunday morning (retweeted by @histnovsoc #HNSLondon14), to see how much this discussion was enjoyed. The general consensus seemed to be that it was too short. And I’ll leave you with two quotes, one from Essie Fox who said research is like homeopathy, to condense it down and take the essence for the story; the other from Kate Forsyth who said ‘Historical Fiction is history set to music’. After this talk, I had chance to speak to Jessie Burton briefly, who is charming and so deserving of her recent success. I asked her to sign a hardback copy of The Miniaturist, which I’ve read on Kindle (mentioned in previous post, How do you choose what to read? ), but I had to get a signed copy for the bookcase. If you haven’t already discovered this brilliant online magazine, you can download it for free here. The quiz was a light-hearted end to the conference, with much laughter. Games included ‘Play Your Books Right’ where the audience and panel had to say ‘higher’ or ‘lower’, depending on when a book was set (like in Play Your Cards Right, Bruce Forsyth’s game show from the 1980s); and a game where members of the audience and panel had to feel objects in a bag and come up with the book title. The objects for Girl With a Pearl Earring were a scrubbing brush, miniature easel and of course a pearl earring. There were workshops and talks, which I didn’t manage to attend as I was helping out with pitches. But I was lucky to have two pitches booked for myself, where I pitched Book 2 for the first time and also talked about Book 1. During one of them, in the heat of the moment, I did say a character in Book 1 lived with the parmesans in Italy during The Second World War, instead of the partisans, which the person I was pitching to found quite amusing. The feedback in both pitches was the most positive yet and I must get Book 2 finished as soon as possible. Time for another spreadsheet and non-stop writing. Feedback from delegates about the conference on Twitter etc has been very positive and I’m sure many will write blog posts. Alison Morton's is here. You'll find others by following @histnovsoc #HNSLondon14 on Twitter. And videos from the main talks will be available to watch soon on YouTube. Only the prospect of an Historical Novel Society Conference would make me get up at 5.45am on a Saturday and Sunday, totally worth doing. Fortunately I located a coffee shop around the corner from the venue, where I started each day with a cappuccino and chocolate twist, before helping out with registration. I was so tired by the end of the two days that I fell asleep on the train home and missed my stop! I try to keep my blog posts as short as possible, difficult when covering such an inspiring weekend, but I’ll stop there. 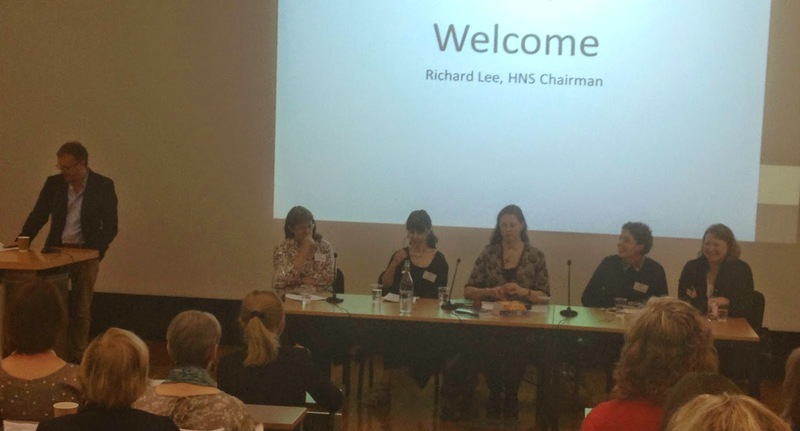 Thank you to Chairman of the HNS, Richard Lee; Jenny Barden and Charlie Farrow for a fantastic conference! And here's a short video by Johnny Yates on the conference, which beautifully captures the spirit of the event. As you'll see there was a lot of laughter. Other videos to follow (will update this post). And here is an excerpt from Conn Iggulden's inspiring Keynote Address (mentioned above), where he tells the two stories about Eddie O'Hare and his son. The full video, by Johnny Yates can be viewed on the Historical Novel Society's YouTube channel. Thank you for this brilliant post Anita. Not being able to attend, it's been fantastic to read other people's blogs from the weekend. I shall certainly look forward to making the next one! This is splendid reportage, Anita. Well worth waiting for until after the school run! I'm going to blog on. Facebook, Twitter, etc. Good luck with your books and look forward to seeing you at next conference. Thanks so much Patricia! It was lovely to meet you. Look forward to seeing you again, and to getting to know your work-have added to my list of writerly things to do! Excellent report, Anita, and thanks for all your hard work with promotion and helping the conference run smoothly. You were a star! Thanks so much Jenny! It was a real pleasure to be involved and a very inspiring conference. Congrats to you, Richard and Charlie!